NEW! 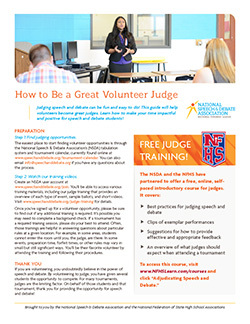 In partnership with the National Federation of State High School Associations (NFHS), this course is designed to help you identify the different types of speech and debate events, review basic judging guidelines, and includes example student performances so you can practice judging while receiving tips on what to note during an actual round. Take our free judge training course! Judges are some of the most vital contributors to the speech and debate community. Without judges, tournaments would not be possible. If you are new to speech and debate and have an interest in judging, this page will walk you through what you need to know in order to be successful. If you are not new but are interested in learning about a new event, or are refreshing your understanding, feel free to jump around and look for the content that applies directly to you. If you’re looking for any of our downloadable resources, simply click the buttons below to access any of our judge training materials. The National Speech & Debate Association has introductory primers for judging all events, sample ballots, and lists of all the scripts used for Interpretation events at the National Tournament available for your convenience! If you are a brand new judge, scroll down to read more information on the essential parts of judging. If you want to stay on top of special opportunities and information, please sign up for this newsletter! Once a month, we’ll send you access to free judge training materials, ways to be a great speech and debate volunteer and team booster, information on student opportunities like scholarships, awards, and free competition resources, and special ways to sport your speech and debate pride! A judge is somebody who has volunteered or been hired by the tournament to evaluate rounds of competition. Typically, tournaments hire judges for the duration of the tournament, which means you will be eligible to judge more than one round. While there are definitely similarities between judging different speech and debate events, there are also many differences. Read on to find out more about the ins and outs of judging all of our types of events! These guides are meant to ease any concerns new judges may have about their ability to successfully adjudicate. Judges are typically hired by tournaments to judge in one of these areas, so there’s no need to be an expert in all four before you judge a tournament. Instead, try and familiarize yourself with the type of judging you have been hired for. All judges are encouraged to be mindful of how they provide feedback to students verbally and/or in writing. One valuable resource we use at the NSDA is the Conscious Style Guide. We encourage all community members, especially those providing constructive criticism to students, to consider the words they use. Simply put, words matter. Learn more about the words you choose by checking out www.consciousstyleguide.com. In speech, a typical round will contain six different contestants, although this number can fluctuate depending on how many students are entered in the event. Prior to the start of the round, the judge will pick up a set of ballots from the tournament organizer. These ballots are where judges will record their thoughts on each performance, suggestions for improvement, and general feedback for the performer. At the end of the tournament, each school will receive all the ballots written about their competitors so contestants can use your feedback to improve! The judge will meet the students in the assigned room and watch the entirety of the round, which usually lasts for one hour. During each speech, the judge will make notes on the ballot, keep the contestant’s time, and ensure the round runs smoothly. Students will occasionally ask for time signals, it is up to you whether or not you would like to honor that request. Time signals are a simple system that let competitors know how much time they have used throughout the speech. The most common time signals are to alert the student when they have two minutes remaining by holding two of your fingers in the air, like a peace sign, and to alert them when they have one minute remaining by holding one finger in the air. In speech, it is common for competitors to enter in more than one event for the tournament, this is called being cross-entered. Student’s who are cross-entered should be allowed to speak earlier in the round if they have another event to go to, and should be excused for entering the round late if they were competing in a different event in the same round. At the end of the round, the judge will evaluate the speakers and rate them on a scale from one to six, with the best performance receiving the one ranking. Depending on the tournament, you may be asked to assign competitors speaker points, typically on a scale from 90-100, with 100 being outstanding. After the rankings are complete, judges should return their ballots to the tournament organizer. During preliminary rounds of the tournament, there is usually only one judge per round. However, when student’s begin competing in elimination rounds, rounds will have more than one judge. This is called a panel. In debate, each round will have two debaters, or two teams, depending on the event. Prior to the start of the round, the judge will pick up a ballot from the tournament organizer. The ballot is where judges will record their thoughts on each performance, suggestions for improvement, and general feedback for the performer. At the end of the tournament, each school will receive all the ballots written about their competitors so contestants can use your feedback to improve! There are two sides to every debate, one side supports the resolution being debated, the other side negates the resolution. In Policy Debate and Lincoln-Douglas Debate, the sides will have been decided before the round. In Public Forum Debate sides are determined by a coin flip at the beginning of the round. All debate events have a unique order to the round, divided into three parts: speeches, cross-examination, and prep time. Speeches are where the bulk of the debating is done, with each team presenting and reinforcing their arguments while refuting their opponents. It is common for judges to flow a debate, which means the judges will take notes about the speeches in order to keep track of the debate. Cross-Examination is a period of time where debater’s can ask each other questions. There are some differences between kinds of debate, but, the purpose of cross-examination remains the same; asking questions that will allow the debater to make stronger arguments. It is up to you whether or not to flow this part. Typically, this is not a time for debaters to be making arguments, instead, it is to clarify their opponents position’s. Each event gives debaters a set amount of prep time, where competitors can take a moment to prepare for the next part of the debate. Competitors can take prep time between speeches and should notify the judges when they begin and end prep. The judge will watch the entirety of the debate and then decide which side won. Depending on the tournament, judges can give an oral critique or disclose the results of the round. An oral critique is when the judge provides the debaters with immediate feedback by talking with both sides after the debate. Similarly, a disclosure is when the judge reveals which side won the debate right after the round. Neither of these are necessary, and, be sure to check with the tournament organizer before giving oral critiques or disclosing. When filling out the ballot, you may be asked to assign competitors speaker points, typically on a scale from 20-30, with 30 being outstanding. After the decision has been made, judges should return their ballots to the tournament organizer. In Congressional Debate, judges preside over a room of student’s as they simulate a session of Congress. Prior to the start of the round, the judge will pick up a set of ballots from the tournament organizer. These ballots are where judges will record their thoughts on each performance, suggestions for improvement, and general feedback for the performer. At the end of the tournament, each school will receive all the ballots written about their competitors so contestants can use your feedback to improve! A typical Congress session lasts longer than rounds for other speech and debate events, and rounds are usually divided into morning and afternoon session. As student’s debate proposed bills and resolutions, judges evaluate each speech that is given during the round. Congressional Debate uses Robert’s Rules of Order, a manual describing parliamentary procedure, which most competitors will be familiar with. However, you don’t need to be an expert to judge Congressional Debate! At the beginning of each session, each house will elect a Presiding Officer (PO), a competitor who will abstain from speaking in order to orchestrate the proceedings. The PO will do things like keep time, call for speakers, count votes, etc. Because the PO does not give any speeches, judges are given a special ballot to evaluate the PO, which should be done at the end of the session. At the end of the session, judges should compile all their ballots and return them to the tournament organizer. Since World Schools Debate is the newest debate event for the National Speech and Debate Association, we decided to ask for help from a World Schools veteran! Click below to watch our nine-part video series, written by Mark Webber, that details all you need to know about judging this new and exciting event. Want to test your knowledge about judging World Schools Debate? Take our quiz after watching these videos! Find the answer key here. Interested in learning more about our Big Questions Debate series? This video will help contextualize our new partnership with the John Templeton Foundation and explore the nuance of our new debate initiatives! Big Questions rounds are between two sides who clash over the big questions considering human purpose and ultimate reality. This year’s resolution is: Resolved: Humans are primarily driven by self-interest. If you’d like to explore our Big Questions Debate series in greater detail, be sure to check out our Big Questions page to learn how to get involved! Take our Big Questions judge training course on CONNECT!